Use the Instrument Explorer to select your market, product type, product, and contract (instrument) directly from MD Trader without first launching the Market Explorer or Market Window. 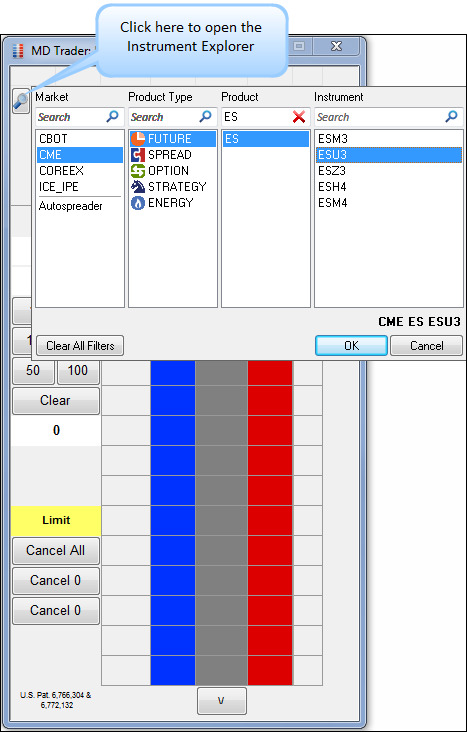 To open the Instrument Explorer, click the icon in MD Trader. Enables you to initially populate the price ladder after launching MD Trader directly from the Control Panel. The ability to change markets and easily locate and roll contracts. From the Instrument Field in the Add Manual Fill dialog box, the Instrument Explorer is also available for pre-populating manual fills with instrument data.